Back in the 1960s, more than a few Toronto musicians made a name for themselves at the legendary Club Bluenote. It was an after hours soul club on Yonge Street just north of Gerrard. 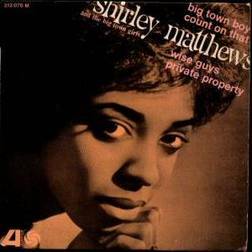 And for a while, Shirley Matthews was the singer with the house band. She'd gotten her start by performing at high school dances while she worked a full-time job as a switchboard operator for Bell. But before long she had a regular gig singing into the wee hours of the morning at the Bluenote, where some of the biggest names in the history of soul music — Stevie Wonder, The Supremes, Edwin Starr, The Righteous Brothers, Jackie Wilson — would stop by to jam after their Toronto shows. She recorded "Big Town Boy" in 1964 and it became a hit — selling more than a million copies. All songs are posted to promote the artist and the history of Toronto. If you're the copyright-holder and would like the song removed, please contact us here and we'll be happy to do so.